Fed up with the traditional and boring menus in your restaurant? Or tired of the expenses spent on the printing and the paperwork of these menus? The customers these days are actually not happy with the services restaurants provide them. They demand a vast variety, fastest services along with the best quality food. This is the point where the concept of digital menus comes to rescue the problem with a set of unimagined benefits and an endless list of services in order to satisfy the customer's needs. As digital menu comes up with enhanced graphics and animations, it has made possible for restaurateurs to display their fine-quality products in an attractive and a cost-efficient manner. Using digital menu gives you the complete control about what to display and when to display. You just need to pre-schedule things by defining the set of items to be displayed along with its timings. Likewise, the menu gets updated automatically like displaying a particular menu for breakfast and switching to lunch’s menu automatically during noon time. The cherry on the cake is when any of your dishes get out of stock, you can simply remove that item temporarily from the menu for that particular period of time. Digital menu’s concept eliminates the queues- the long queue of waiting and frustrated customers. So digital menu takes a step forward by adding digital signage of the restaurant and displaying other interesting deals and content on the screen. Thereby, engaging the customers while standing in a queue. 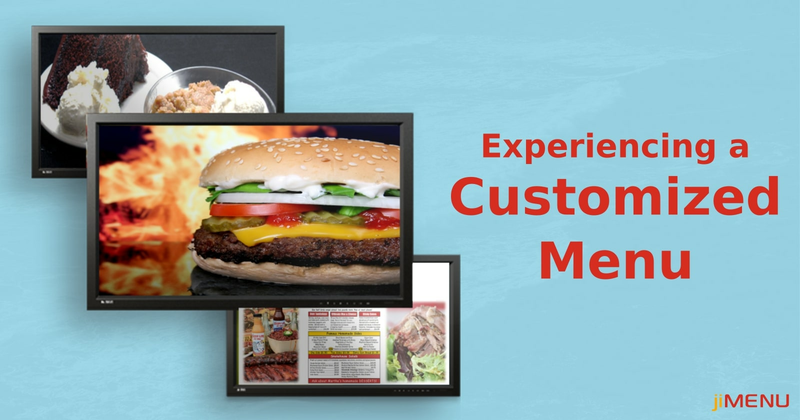 Another advantage of availing for digital menu boards is that it can be monitored or handled remotely regardless of the customer’s current location. If you have the access to the digital menu plus a proper internet connection, you can make amendments anytime and anywhere. Apart from these benefits, these menu boards provide you with a fully customized atmosphere, thereby allowing you to add items, description, images, style, videos in a high definition graphics support just the way you wish to. Digital menu is compatible with all the platforms i.e. from your PC or your personal mobile and supports every operating system- windows, mac, Linux, etc. Being cost-effective, the digital menu comes with a minimal cost and a free-trial option too. Estimated records show that digital menus are capable enough of uplifting sales over 50% in the coming years. One of the best digital menus in the market is “jiMenu”- a digital menu system that assures to keep your restaurant as busy as never before. It has the framework providing the best-visualized menu, thereby increasing the customers awareness and maintaining trust. It does have the capability to integrate with the existing POS framework. It allows its customers to enjoy the benefit of its customized services by selecting their order as per their taste and moods. These are just a few highlights of this product, there are endless add-ons available which would be seen very soon. Save paper and save money- become eco-friendly this season!! !